To elaborate a bit on some of the discussion in the last chapter, a big thing that underwrites the difference between “A Man Alone” and “Aquiel” from a narrative procedural standpoint is the differing, though complimentary, central focus of their parent series. In the context of those episodes, I phrased the difference between Star Trek: The Next Generation and Star Trek: Deep Space Nine as being primarily one of scale-The former works best when it's seen as a counterintuitively intimate show about a close-knit family team of voyagers, while the latter gives us a community-sized look at an entire urban geopolitical region extrapolated to a science fiction setting with interweaving stories about several different families set against a large-scale cast of characters. But there's one other major distinguishing characteristic of Star Trek: Deep Space Nine's approach, and it's one “Past Prologue” is the key episode in setting in motion. Namely, although it's every bit as utopian as Star Trek: The Next Generation, it examines this utopianism from a different angle: Whereas the Enterprise is a utopian setting by default, even down to the fact “Encounter at Farpoint” essentially establishes it that everyone aboard knows each other in some capacity already and has some history with at least one another person (the exceptions would seem to be Worf and Tasha Yar, solely for the reason they were last-minute additions to the cast, though the mid-fourth season reboot does retcon shared backstories for Tasha and Captain Picard in), Deep Space 9, in accordance with this show's key themes about building and healing, has to be made utopian through the generative and commutative efforts of the people who live there. That sense of community and mutual trust that comes so easy aboard the Enterprise isn't here yet, and by design, and a significant portion of the first/sixth season is about fostering that. A lot of critics will turn this contrast into a judgment of quality, making the claim that the lack of familiarity aboard Deep Space 9 is objectively better than the premise of Star Trek: The Next Generation because it encourages conflict and conflict is always better in absolutely every circumstance for everything. I don't think this is the case for a healthy variety of reasons...Setting aside for the moment my extremely well-documented distaste for the (in my opinion) crass and juvenile conception this team has of what the word “conflict” in a dramatic sense actually connotes, by the very narrative structure Star Trek: Deep Space Nine operates under, this crew is going to get to a level of Enterprise-style intimacy and comfortable familiarity at some point, and presuming that “conflict”, where “conflict” is defined as “people screaming at, disappointing and betraying each other constantly”, is always better all the time would seem to be setting up the show for what they would consider failure at some future date. Were they just planning to cancel Deep Space Nine whenever the crew started actually getting along with each other? I find that difficult to believe, considering A. This show was designed as the Heir Apparent for Paramount's biggest cash cow and B. That date comes roughly midway through this half-season. No, rather than an Aesop about how “good dramatic storytelling” is “supposed” to work, I see this more as another manifestation of the different scopes these two shows operate under. And “Past Prologue”, which admittedly and assuredly has all the “conflict” in the world to make the Ira Behrs and the Michael Pillers happy, is secretly all about utopianism. Every character here has some utopian ideal they bring to the table and strive to live up to themselves. The trick is, it's not the *same* utopian ideal as any other person: Kira Nerys and Tahna Los once shared the same ideal for what Bajor should be, but Kira eventually changed her mind, especially after the wormhole was discovered (and I have to wonder what she must be thinking, given that the Prophets chose to contact Sisko and Dax, but not her or any other native-born Bajoran). Both are in their own minds fighting “for Bajor”, but they've now come to disagree on what “for Bajor” means. The Starfleet officers have ideals of their own, and thankfully the episode never gets so crass as to suggest that they're cushy and out-of-touch military aristocrats and imperialists, because that's tone it absolutely could have taken and something a fair few creative figures on this show seem to believe themselves, given the stuff they've gone on the record saying. Kira and Tahna believe that, but the story doesn't give either one of them the moral high ground on the issue, which I definitely appreciate. And even at this early a stage, we're seeing glimpses of how, just like the Enterprise crew, the Deep Space 9 team is not cut from the same Starfleet cloth as that of their superiors in the admiralty of Starfleet Command: This is two episodes in a row Commander Sisko is willing to throw curveballs and take counterintuitive gambles, and while Jadzia Dax doesn't get a ton to do this week there's still a distinct aura about her. And then there's Doctor Bashir, who is just this delightfully rambunctious little puppy. He fancies himself the hero in some trumped-up 1960s action spy-fi movie, which is probably exactly what he expected life in Starfleet to be like. But, like, this weirdly effeminate kind of naive debutante secret agent, which is a spin on the concept that has to be 100% uniquely and exclusively his. It's almost this oddly subby drag performance of Starfleet as filtered through Julian's positionality: Everyone in Command takes their jobs super-duper seriously, but Julian is almost consciously play-acting, drawing explicit attention to Star Trek's pulp action sci-fi roots in a way not even the workaday “lets just play along with them so we can get back to exploring the cosmic wonder” ethos of the Enterprise crew is completely able to do. So of course Garak is the key compliment to Julian here right from the start. Garak may or may not be a spy, but what's important about him right now is that he knows Julian thinks he's a spy (as do Lursa and B'Etor) and reacts accordingly. He plays along, putting on an act of his own. And in this way, he takes it upon himself to be the young doctor's mentor, using Julian's giddy enthusiasm for super-duper-super-secret-super-spy stuff to gently lead him to be more aware and perceptive of his world so that he can actually help make a positive material difference in it. And this is the moment where it becomes abundantly clear that no matter how deliberately mysterious and misleading Garak's backstory might be, he's unequivocally going to be one of the good guys: Everything he does here is in service of the material good of Deep Space 9: He's actively opposed to the Kohn-Ma and the meddling of Lursa and B'Etor not because he wants to sell Bajoran nationalists out to the Cardassians (he even plays them too so that Commander Sisko and Chief O'Brien have an easy out in the climax), but because he wants to see the wormhole and the station, and thus its spiritual and utopian lives, continue to exist and grow. Which I suppose brings us to the key ethical question of this episode: Was Tahna Los in the right? Do the Kohn-Ma have the right idea? I certainly wouldn't be one to cast criticism on the idea of armed resistance to a brutal fascist occupying regime, and even Kira agrees there's little difference between the Cardassians and the Federation in that regard. 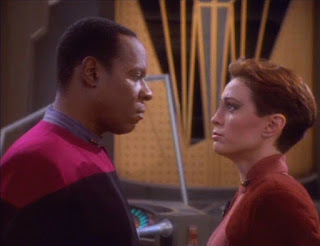 One could certainly read the ultimate solution Kira comes to, through Sisko, to be one of capitulation and compromise: A hoary old moderate liberal, and inherently hegemonic, perspective of politely and dutifully asking for concessions and small favours from the ruling class. I don't think that's quite what's happening though, and I also can't personally cast my lot in favour of the Kohn-Ma in this story. For one, I don't think Commander Sisko represents the party line for what Starfleet interests in Bajor are. I understand it'll take time to convince Kira, and one hypothetical audience, that this is the case, but I do believe that it is. More basically though, and at the risk of being in the position of the privileged passing judgment on the oppressed and dictating how they can and cannot deal with their oppression, I think the Kohn-Ma are at heart a reactionary fundamentalist movement and this is their fatal flaw. This is embodied in two key lines: Tahna's sloganeering of “Bajor for Bajorans” and his staunch opposition to the wormhole. The wormhole, the Celestial Temple itself, stands for cosmopolitanism, worldliness and interconnected enlightenment. Not only does it bring Bajor contact with many different cultures and perspectives, it is the literal source of their spiritual enlightenment which, just like real-life spiritual enlightenment, is only possible once you realise you are without and within the entire universe always. So the Kohn-Ma's hatred of the wormhole is a recalcitrant and reactionary response to being confronted with this essential truth: It is in every sense a desire to deny reality in an attempt to go back to a perceived simpler state of being. A desire for solipsism over enlightenment. They hate anything that smacks of growth or networked existence because it forces them to call their long-held beliefs and assumptions into question. That's something people like Tahna are not prepared to deal with, and it's a staple of right-wing reactionary movements the world over. Odo even begins to draw a direct parallel with burying one's head (not even in sand, but underwater) and catches Kira's statement that the Tahna Los is “just the way [she] used to be”: The Kohn-Ma represent an essentially adolescent worldview and state of mind that it's necessary to move beyond if one is to make true progress down a spiritually sublime path. Sometimes, the universe has to drag us into utopianism kicking and screaming, whether we want to go or not. First an observation (which is spoilery for a Miles Vorkosgan story so skip this paragraph if you don't want to know): it's likely just one of those weird coincidences, but it looks to me as if Lois McMaster Bujold nicked the terrorist plot from this episode for one of her books, along with an almost-homophone of a significant name. It doesn't matter because - just as it is here - the plot in question is merely the generating force for a very character-based story. Oddly, I haven't seen this similarity mentioned anywhere, even though it's blindingly obvious if you know both. Regarding how right or wrong the Kohn-Ma are, my personal feeling is that they probably were an unpleasant necessity in the past but have now become so damaged by their struggle that they cannot see beyond one particular viewpoint. This is one of the dangers of resistance, because resistance movements evolve to fit a particular role, and when circumstances change and different traits are more useful they often fail to adapt. Which is a tragedy rather than an argument against resistance! So look at what they did during the Cardassian occupation (without the smug complacency of those who've never had to live through it), and - if they were doing their best at the time - thank them for it. Then ask them to get out of the way. Josh, I love your characterisation of Bashir here! I hadn't thought about it in that way but it fits perfectly. And it's great to see him with Garak. Just to clarify, "ask them to get out of the way" applies to this specific group (and, I guess. any group whose actions now do more harm than good to the people they are supposedly fighting for), not to resistance movements in general! Failure to adapt is a ghost that will consistently haunt DS9, though watching now I'm pleased to see that our Starfleet reps here are very, very adaptable people. But that is rather the point of the whole scenario. Change is hard. Progress is hard. Regress is often easy, but is also sometimes hard. Hardliners might have had to straight up abandon their faith in the Prophets to do what they felt needed to be done against the occupation, and now that fatalism extends to the dangers inherent in the Prophets temple itself. Conversely (see the end of this season and beginning of the next), hardliners may double down and try to make their faith work for their own agendas, sort of the opposite take. Balance is tough, and cool, long-lived cats like Jadzia kind of make it look easy through years of experiential difference. Even Sisko's patience here oozes experience, to be honest. A dispassionate eye, and less of a proximity bias. He's still got a stake in the game, but it's not the same stake Kira's playing with. It's hard to drop "life and death" stakes. But she does indeed adapt. Past Prologue is so clearly Episode 2. You get to DS9, the Bajoran station, in the first episode and meet everyone. Learning about Kira is the next progression, not learning about Odo. Odo can certainly come close after Kira (Odo and Quark, somewhat, too), as they're the historical connection to the station's recent past, but she's number 2 priority after the pilot, and even Bashir's wide-eyed excitement here plays better "before" his excellent and slightly more settled in professionalism in the Ibudan case in A Man Alone. Garak is an interesting case. I'm sure by the end we'll have reams of notations about Andrew Robinson's casting and the subtext with Julian and the savvy subversion and playing of spy tropes and even just the element of fashion that he adds to the 24th Century that didn't quite exist before. But here I just want to reflect on the fact that while he wasn't in the pilot, he is here in Episode 2 (or 3) and the trajectory of his importance very much echoes that of Chief O'Brien - there from the beginning and doubling in import every season. The difference is this time, they planned to plant that seed. With O'Brien, it was a fortuitous coincidence that Colm Meaney is just so damned memorable and good. And speaking of adaptive concepts, I love how the Kohn-Ma literally represent any such group, and not just the ones that were sort of the "current event" parallels during the years right around when this episode debuted. Since 1993 we've seen dozens of historical parallels. Watching it this time around I was thinking of completely different parts of the world than the first time I watched it. "The Kohn-Ma represent an essentially adolescent worldview and state of mind that it's necessary to move beyond if one is to make true progress down a spiritually sublime path." One of the things that *really* got me into DS9 when I first watched it was the arrival of a deeper mysticism within the show, that had been there within TNG, but maybe sometimes less a fundamental plot element. Here, it's a part of the world.